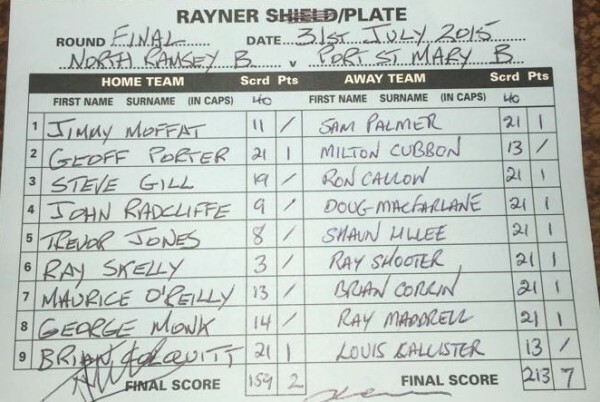 Port St Mary B have won the Rayner Plate for the second time beating North Ramsey B 213-159. There were only six matches played in the Trend sponsored ladies’ over 60’s league on Tuesday 28 July. Nobles were top scorers, dropping just two points courtesy of Muriel Cain’s 21-19 win over Josie Harding. Pat Kelly almost added a second game, losing out 20-21 to Pat Robertson. The Castletown players all reached double figures at Port St Mary A, and with Ann Hollingworth having a good win to single figures they ended only 10 chalks adrift despite going down 5-1 on games. Onchan A also won 5 games, Edwina Reid saving Port St Mary B’s blushes, winning to single figures. They nearly had a second game as Pauline Worrall reached 20 against Marilyn Ellison. Moira Anderson and Lilian Slinger both won to single figures for Mooragh Park against Marown, who replied with four wins, three of them also to single figures. Ballaugh were in ruthless mode against Onchan B for whom only Barbara Kennaugh recorded a win, albeit to single figures. The home side won four of their five games to single figures, Eileen Killey being the only other player on the away side to reach double figures Peel Sunset struggled at Breagle, drawing on games and winning by a mere four chalks. 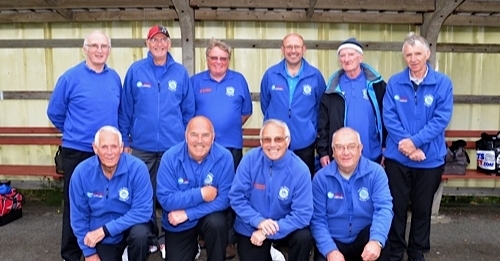 Onchan A moved within touching distance of yet another Isle of Man Bank Division One title after two hard fought victories over tough opposition sees them move eighteen points clear at the top. They hosted Douglas A on Monday night and with Douglas being the only team to beat them this year knew they had a fight on their hands. The Villa men put in a spirited performance in a match which could have gone either way but fell just short on this occasion losing out 7-3. The champions then travelled to Marown A for the hugely anticipated top of the table clash, with the Crosby men needing to make up some ground on their rivals to stand any chance of snatching the title for themselves. Marown would have been pleased with how the week started as their 9-1 win away at Castletown A had seen them already claw two points back on Onchan. The early stages of the old firm match were as even you would expect and with things finally balanced at three apiece it looked like the home side might just pull it off. It wasn’t to be though as Onchan’s tail showed their strength in depth as they took the remaining games to seal a 7-3 victory, and all but assure themselves of the silverware. Port St Mary A are the form team at the moment and after a brilliant week have moved into third twelve points behind Marown with a game in hand. They began the week with a brilliant 7-3 away win over high flying South Ramsey A and backed this up with a solid 8-2 home win over Castletown A.
Port’s primary aim will be to secure third spot but if they can make use of the extra game and Marown falter you just never know they might just pull off a massive upset and break into the top two. South now find themselves in fourth place just two points above Douglas A after the sides won 7-3 and 9-1 respectively on Wednesday night. The top five are thirty points clear of North Ramsey in sixth, who are themselves 20 points clear of seventh, so whilst I don’t think anyone else can displace the top teams the order is still all to play for and Douglas will have their eyes on fourth spot. South Ramsey B are turning the screw at the top of Division Two and a 9-1 victory away at Marown B backed up with a solid 6-4 showing against Port St Mary B will do their title aspirations no harm at all. Port B are flying high too and their own 6-4 victory over Ballaugh B keeps them in the hunt for main honours. Douglas B need to relight the fire behind their challenge if they want to be at the top of the pile come September after they dropped points going down 7-3 away at North Ramsey B in their only match of the week. Douglas C caused an upset in Division 3 on Tuesday as they beat runaway leaders Onchan C 7-3 at the Villa Mariina. It’s hard to believe that this high flying Douglas side picked up only one win in the final fixture of last season as they are now a match for anyone they play. South Ramsey were top scorers in the C Tarleton Hodgson and Son Ltd sponsored league on Friday 24 July, winning 7-2 on games with three wins to single figures. The two winners for Douglas were Pat Kelly and Jan Osborne who pipped Jill Quayle 21-20.Peel Sunset had their third 5-4 win in a row, but this time also managed to win on points ! Rebecca Teare’s win to single figures was matched by Cath Parker and Philippa Taylor, while Debbie Leece made a strong come back before losing out 20-21 to Heather Horsburgh. It was a close, if low-scoring, match at Ballaugh where the home team won 6-3 on games with two wins to single figures. In reply Mooragh Park’s three winners, Helen Martin, Janet Monk and lilian Slinger also won to single figures. League leaders Port St Mary A won five games, three to single figures, against Castletown while there were also some very close encounters in the match, while Marown had the better of Onchan 6-3 on games, the feature match seeing Lil Smith just edge out Dee Lewis 21-20.Carol Kaye had a good win to single figures for Port Erin against Purt le Moirrey, where the other games were much closer with a 21-19 to each team and Linda Dawson losing out 20-21 to Voirrey Curphey. This was a close match with the advantage going to Nobles by 10 points. Both teams had two wins to single figures while, in contrast, Peggy Griffin reached 19 against Sonja Lees and Debbie Leece just lost out 20-21 to Ellie Faragher. There was a field of 24 for the Jordan Cup ladies’ singles played at Nobles’ on Saturday 25 July. Once again the weather was fine and the green was interesting. Quarter-finals: Sylvia Kennaugh 21, Lilian Slinger 20; Heather Horsburgh 21, Jo Smith 18; Helen Martin 21, Debbie Leece 17; Margaret Tasker 21, Lin Ruscoe 7 Semi-finals: Sylvia Kennaugh 21, Heather Horsburgh 15; Helen Martin 21, Margaret Tasker 13 In the final both players produced some excellent bowling, early exchanges seeing them level at 8-8 before a spurt of five ends saw Sylvia advance to 14-8. Helen took five of the next six ends to take a lead of 16-15 which Sylvia levelled to 16 across on the next end. She then scored two 2’s and a single to take the match, and her first trophy, 21-16. Committee member, Joyce Ogden thanked everyone before presenting the prizes. The weather stayed fair for the ladies’ doubles, for the Onchan Commissioners’ Cup, played on Wednesday 22 July. The field of 16 pairs produced some entertaining bowls played in good spirit. Semi-finals: Janet Monk and Lilian Slinger 21, Philippa Taylor and Heather Horsburgh 11; Paula Garrett and Lyn Bolton 21, Rosie Winckle and Shirley Whelan 14 In the final Paula and Lyn were first out of the blocks, winning the first five ends to take a 13-6 lead. A 2 followed by three 3’s gave the advantage to Lilian and Janet, which they never relinquished, despite Paula and Lyn winning two more ends, taking the game 21-16. Competition secretary, Marilyn Ellison thanked all those who had helped to make the afternoon a success before introducing the chairman of Onchan Commissioners, Robin Turton, who presented the prizes. Joan Murphy spoiled the party for Peel Sunset on Thursday 23 July, winning her game to deny them a full house against Villa, on a morning when Ballaugh also passed the 120 point mark. Edwina Reid and Pauline Worrall, who edged out Ann Gale 21-20 were the two winners for Port St Mary B, while Chris Holland almost levelled the game score, just losing out 20-21 to Mary Simmonds. Port St Mary A won four games at Onchan B, the two winners for the home side being Barbara Kennaugh and Wendy McDowell who just pipped Margaret Tasker 21-19. Three wins to singles figures gave the visitors a strong points lead. It couldn’t have been much closer at Port Erin where it ended level on games with a win to single figures for each side, the visiting side coming through by just one chalk. Onchan A had a 5 point advantage over Marown in another close match while Douglas had the advantage against Nobles, Sue Caley winning to single figures for the home side as did Lin Ruscoe for the visitors. Pat Robertson came close to making the match 3-3 on games reaching 20 against Moire Turner. Although there were no maximums in the Trend sponsored over 60’s league on Tuesday 21 July two teams came very close. Carol Kaye spared Port Erin’s blushes as her 21-20 win against Maureen Payne denied Onchan A a full house, while Roma Ware’s 21-19 win over Wendy Kennaugh prevented a whitewash for Port St Mary B. In contrast only two points separated Villa and Castletown in a match that ended level on games with each team having a win to single figures, courtesy of Pat Kelly and Ann Hollingworth. Mooragh Park and Douglas ended level on games, with Moira Anderson winning to single figures for the home side as did Lynne Mansley and Jan Osborne for the visitors, giving Douglas the advantage on points. Nobles put on a strong performance at Peel winning five of the six games, Joyce Kelly being the lone winner for the home side. Onchan B also won five games on their trip to Breagle. The home side fought well and all reached double figures, Kay Primrose- Smith winning to single figures and Gwen Tuck reaching 20 against Eileen Killey, to take their total past the 100 mark. The match at Ballaugh also ended 3-3, with Ann Gale for the home side and Mary Alderson for the visitors winning to single figures. Peggy Griffin and Mary Black had quite a tussle with Peggy coming through 21-20. Neil Withers got one over on his fellow victor from the day before as he and partner Lyn Bolton won the Marown mixed doubles with a 21-7 final victory over Jordan Cain and Paula Firth. Withers & Bolton were on fire from the off and were going to be difficult for anyone to beat, although they were pushed close by John & Fiona Kennish in the semi-finals with the former winning 21-17. Cain and Firth were also embroiled in a battle for their final birth however after progressed with relative comfort in the end with a 21-13 win over James Teare & Jenny Moore. Fallers at the Quarter final stage were Rona Argallon & Grahem Moore, Margaret Tasker & Ken Karran, Joyce Ogden & Mike Hargraves and Mavis Franks & Derek Allan. A brave 31 pairs endured the weather which for most of the competition was wet and windy although everyone seemed to enjoy themselves and a tremendously well run competition. 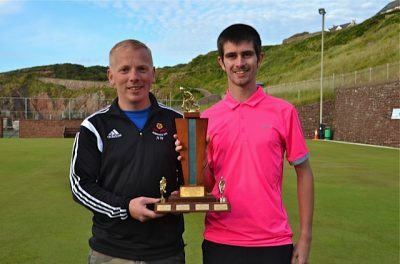 Neil Withers and Jordan Cain defended the title they won last year with a 21-13 final victory over Arnie Withers & Phil Kelly at Peel on Saturday. Withers & Cain were in fine form from the off with displays almost as colourful as Jordan’s Pink ensemble as they bowled their way to victory on a tremendously well prepared surface. 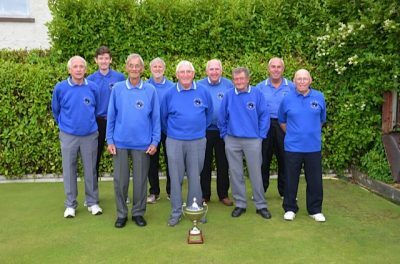 Peel Bowling Club should be commended for another well ran and supported competition with 30 pairs making the pilgrimage to the West. They should also be commended for an immaculate green which was simply fantastic to play on.